Doesn't it seem like the speed of life just keeps increasing? What happened two days ago can often feel like a week ago. Sometimes our emotions can't keep up and we feel stressed and overwhelmed. It's important to learn how to slow down on the inside even if we have to move fast on the outside. President and CEO of HeartMath Inc. Doesn't it seem like the speed of life just keeps increasing? What happened two days ago can often feel like a week ago. Sometimes our emotions can't keep up and we feel stressed and overwhelmed. It's important to learn how to slow down on the inside even if we have to move fast on the outside. 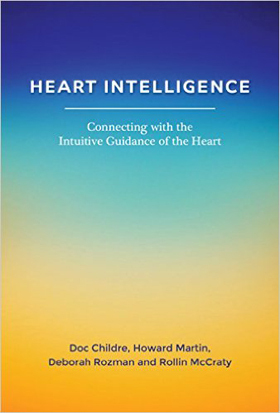 That's why I co-authored with three associates from HeartMath: Heart Intelligence: Connecting with the Intuitive Guidance of the Heart. It covers profound new research on the heart as an intelligence system that we can learn to connect with as well as practical applications for more fulfilling and healthier living. I want to share an excerpt from the book that explains how to slow your inner speed without compromising productivity and move in a true state of inner ease to navigate your choices more effectively. People tell each other at times to "ease up and find the flow." An advanced practice for finding the flow is learning to create the flow, especially in non-flowing situations. We have the power in our hearts to do this. When a seasoned surfer experiences the flow, it's not dependent on having perfect waves--flow is especially about how gracefully she adjusts to daunting waves or turbulent weather. She is poised in inner balance and creates her own flow to suit each environmental circumstance. We all are constantly surfing through life's potentials along with its challenges and inconsistencies. How we greet them decides our ratio of flow or how much stress we accumulate from situational resistances. Practicing ease creates flow by helping to regulate the balance and cooperation between our heart, mind and emotions (coherence). Each day people are telling each other to "just breathe". What we're saying is yes, breathe, but add the attitude of calm and ease as you breathe, which can help quieten the mind and emotions--so that intuitive guidance can be accessed. It's important to learn to feel when you really are in ease instead of assuming it. Breathing inner ease throughout the day will help anchor the pattern into your cellular memory. With practice, you will find this increasingly helpful for stabilizing your emotions and maintaining your balance. Again all I mean by breathing ease is: As you casually breathe, imagine breathing in the attitude of calm and ease -- the same way we tell kids to do. · When you want to prevent or reduce anxiety. · To prevent or restore energetic composure from overwhelm. · While discerning important issues or choices. To slow down your mental and emotional traffic so that intuitive insight can be perceived. · When you want to be creative, as ease draws (or unleashes) intuitive direction. · When life's challenges are coming in faster than solutions. · Before sleep if you have sleep problems.